Baton Rouge, LA – April 23, 2014 - Lamar Advertising Company (Nasdaq: LAMR), a leading owner and operator of outdoor advertising and logo sign displays, announces that it has received its requested private letter ruling from the U.S. Internal Revenue Service (the “IRS”) regarding certain matters relevant to its intended election to be taxed as a real estate investment trust (REIT) under the Internal Revenue Code of 1986, as amended (the “Code”). 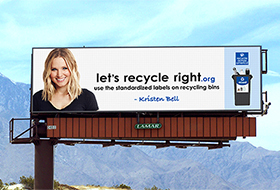 As previously announced, Lamar intends to make an election under §1033(g)(3) of the Code to treat its outdoor advertising displays as real property for tax purposes. The private letter ruling confirms, among other matters, that Lamar’s income from renting space on such outdoor advertising displays qualifies as rents from real property for REIT purposes. Lamar’s conversion to REIT status is expected to be effective as of January 1, 2014. As previously announced, Lamar completed an internal corporate restructuring at the end of 2013 so that it would be in compliance with applicable REIT rules for the 2014 taxable year. Under the new structure, we hold and operate certain of our assets that cannot be held and operated directly by a REIT through taxable REIT subsidiaries, or TRSs. A TRS is a subsidiary of a REIT that is taxed as a regular corporation. Our TRSs primarily hold our transit advertising business and foreign operations in Canada and Puerto Rico. In addition, our TRSs perform certain activities and services for our customers that a REIT cannot perform directly. The TRS assets and operations would continue to be subject, as applicable, to federal and state corporate income taxes. Furthermore, assets and operations outside the United States will continue to be subject to foreign taxes in the jurisdictions in which those assets and operations are located. As a REIT, we will be required to distribute annually at least 90% of our REIT taxable income (determined without regard to the dividends paid deduction and by excluding net capital gain). Our REIT taxable income generally does not include income earned by our TRSs except to the extent the TRSs pay dividends to the REIT. We expect to have net operating loss carry forwards, or NOLs, as of the time of our REIT conversion. To the extent we use these NOLs to offset our REIT taxable income, the required distributions to stockholders would be reduced. However, in this case, we may be subject to the alternative minimum tax. As part of our reorganization to meet the REIT qualification requirements, we expect to complete a merger of Lamar into a newly formed, wholly owned subsidiary. This merger will be subject to approval by Lamar’s stockholders. The merger will incorporate certain stock ownership limitations into the organizational documents of the REIT to ensure that we comply with the ownership requirements applicable to REITs, namely that five or fewer individuals (and certain entities) may not own more than 50% of the value of our stock during the second half of any taxable year. In accordance with tax rules applicable to REIT conversions, Lamar is required to distribute its earnings and profits accumulated through the end of 2013 to stockholders during its 2014 taxable year. Based on its analysis, Lamar estimates that the aggregate amount of accumulated non-REIT E&P will be approximately $40 million. Currently, Lamar’s Board does not expect to make a special distribution to its stockholders on account of its accumulated non REIT E&P. We plan to distribute this amount along with the regular quarterly distributions to stockholders that Lamar expects to commence during 2014. Lamar anticipates that these distributions will be made solely in cash. The guidance provided below is based on a number of assumptions that management believes to be reasonable and reflect our expectations as of April 23, 2014. Actual results may differ materially from these estimates as a result of various factors, and we refer you to the cautionary language regarding “forward looking” statements included in this press release when considering this information. 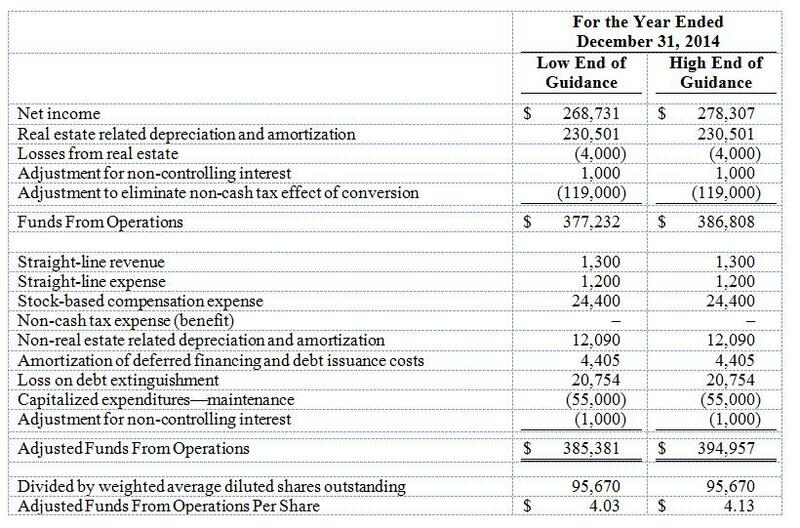 (2) See “Non GAAP Measures” below. We expect to invest approximately $100 million in total capital expenditures in 2014, consisting of approximately $45 million to acquire new assets that we expect will enhance revenues and the remaining $55 million for maintenance of existing assets and the acquisition of operating equipment necessary for the business. On April 21, 2014, Lamar Media Corp., our wholly owned subsidiary, redeemed in full all of its outstanding $400 million in aggregate principal amount of 7 7/8% Senior Subordinated Notes due 2018 at a redemption price equal to 103.938 % of the aggregate principal amount of the notes, together with accrued and unpaid interest to (but not including) the redemption date. The total amount paid to redeem the notes was approximately $416.3 million, which was funded with a combination of $300 million in new term debt under its senior credit facility, borrowings under the revolving portion of its senior credit facility and cash on hand. Lamar is hosting an investor conference call on Wednesday, May 7, 2014 at 10:00 a.m. (central time) to discuss the Company’s results for the first quarter ended March 31, 2014 and answer questions relating to company operations, including with respect to the Company’s anticipated conversion to a REIT and the 2014 financial guidance included herein. Live Webcast:	In addition, a live webcast of the conference call may be assessed on the Investors/Webcasts section of our website at www.lamar.com. Click here to join the live webcast. Funds From Operations, Adjusted Funds From Operations and Adjusted Funds From Operations Per Diluted Share are not measures of performance under accounting principles generally accepted in the United States of America (“GAAP”). These measures should not be considered alternatives to net income or other GAAP figures as indicators of the Company’s financial performance. We define Funds From Operations as net income before gains or losses from the sale or disposal of real estate, real estate related impairment charges and real estate related depreciation, amortization and accretion, and including adjustments for (i) non controlling interest and (ii) a one time non cash tax effect of conversion. We define Adjusted Funds From Operations as Funds From Operations before (i) straight line revenue and expense, (ii) stock based compensation expense, (iii) the non-cash portion of our tax provision, (iv) non real estate related depreciation, amortization, (v) amortization of deferred financing and debt issuance costs, (vi) loss on debt extinguishment, and adjusted for (vii) non controlling interest, less cash payments related to capital improvements and cash payments related to corporate capital expenditures. We define Adjusted Funds From Operations Per Share as Adjusted Funds From Operations divided by the diluted weighted average common shares outstanding. Our management believes that Funds From Operations, Adjusted Funds From Operations and Adjusted Funds From Operations Per Diluted Share are useful in evaluating the Company’s performance and provide investors and financial analysts a better understanding of the Company’s core operating results. Our presentations of these measures may not be comparable to similarly titled measures used by other companies. See “Calculation of Projected Adjusted Funds From Operations and Per Share Guidance” below, which provides reconciliations of each of these measures to the most directly comparable GAAP measure. This press release contains forward-looking statements, including the statements regarding its consideration of an election to real estate investment trust status; its ability to complete the REIT conversion effective for the taxable year beginning January 1, 2014; its intention to distribute accumulated earnings and profits to stockholders and make regular quarterly distributions to stockholders in 2014; and its financial guidance for 2014. These statements are subject to risks and uncertainties that could cause actual results to differ materially from those projected in these forward-looking statements. These risks and uncertainties include, among others: (1) that Lamar may fail to quality as a REIT effective for the taxable year beginning January 1, 2014 or at all, and, if it does quality as a REIT, it may be unable to maintain that qualification (2) legislative, administrative, regulatory or other actions affecting REITs, including positions taken by the IRS; (3) Lamar’s significant indebtedness; (4) the state of the economy and financial markets generally and the effect of the broader economy on the demand for advertising; (5) the continued popularity of outdoor advertising as an advertising medium; (6) Lamar’s need for and ability to obtain additional funding for operations, debt refinancing or acquisitions; (7) the regulation of the outdoor advertising industry; (8) the integration of any acquired companies and Lamar’s ability to recognize cost savings or operating efficiencies as a result of these acquisitions; and (9) the market for Lamar’s Class A common stock. For additional information regarding factors that may cause actual results to differ materially from those indicated in our forward-looking statements, we refer you to the risk factors included in Item 1A of our Annual Report on Form 10-K for the year ended December 31, 2013. We caution investors not to place undue reliance on the forward-looking statements contained in this document. These statements speak only as of the date of this document, and we undertake no obligation to update or revise the statements, except as may be required by law. Lamar Advertising’s decision to proceed with a REIT election remains subject to the final approval of its board of directors. Although Lamar has received its requested private letter ruling from the IRS, this does not guarantee that Lamar will succeed in qualifying as a REIT and there is no certainty as to the timing of a REIT election. Lamar may not ultimately pursue a conversion to a REIT, and it can provide no assurance that a REIT conversion, if completed, will be successfully implemented or achieve the intended benefits. Lamar Advertising expects to reorganize its operations in connection with the proposed REIT conversion and as part of this reorganization it plans to effect a merger with and into a wholly owned subsidiary of Lamar Advertising, which will be called Lamar Advertising REIT Company. Lamar Advertising will file a proxy statement to be used in connection with the stockholder vote on this merger. That proxy statement will be contained in a registration statement on Form S-4 to be filed by Lamar Advertising REIT Company, and both companies will file other relevant documents concerning the proposed merger transaction with the Securities and Exchange Commission (SEC). INVESTORS ARE URGED TO READ THE FORM S-4 AND PROXY STATEMENT (INCLUDING ALL AMENDMENTS AND SUPPLEMENTS THERETO) WHEN THEY BECOME AVAILABLE AND ANY OTHER RELEVANT DOCUMENTS FILED WITH THE SEC BECAUSE THEY WILL CONTAIN IMPORTANT INFORMATION ABOUT THE PROPOSED MERGER. You will be able to obtain documents free of charge at the website maintained by the SEC at www.sec.gov. In addition, you may obtain documents filed with the SEC by Lamar free of charge by contacting Secretary, 5321 Corporate Blvd., Baton Rouge, LA 70808. 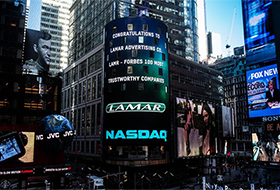 Lamar Advertising, its directors and executive officers and certain other members of management and employees may be deemed to be participants in the solicitation of proxies from Lamar Advertising’s stockholders in connection with the merger. Information regarding the persons who may, under the rules of the SEC, be considered participants in the solicitation of proxies in connection with the merger will be included in the Form S-4 and proxy statement when they become available. Information about the directors and executive officers of Lamar Advertising and their ownership of Lamar Advertising stock is set forth in the proxy statement for Lamar’s 2013 Annual Meeting of Stockholders. Investors may obtain additional information regarding the interests of such participants by reading the Form S-4 and proxy statement for the merger when they become available. Investors should read the Form S-4 and proxy statement carefully when they become available before making any voting or investment decisions. Lamar Advertising Company was named one of 'America's 100 Most Trustworthy Companies' by Forbes.